Chichen Itzá Mexico’s most extensively restored archaeological park, and has always been the most-visited, but since it was voted as one of the New Wonders of The World in 2007, the publicity which surrounded this anointment served to attract even more visitors. The ancient city of Chichen Itzá — which means “the mouth of the well of the Itzás” — is one of the most impressive archaeological sites in Mexico. The archaeological site takes up about four square miles and it will take you all day to see it properly. The temples are laid out in such a fashion that they represent time, akin to an enormous calendar. Much of the Mayan and Toltec cultures are still a mystery and there is disagreement between scholars over how the Mayas arrived here and their relationships and interactions with the Toltecs. This doesn’t take away from the immense feeling of size and grandeur of this location; even when it is full with tourists, there is so much space that, aside from the main temple which tends to become crowded, you can feel quite relaxed wandering around the park. Official local guides situated at the site will take you on a tour and explain the history of the site and the Mayan culture. This region of Mexico gets extremely hot during the peak daytime hours of noon until around 4 pm. 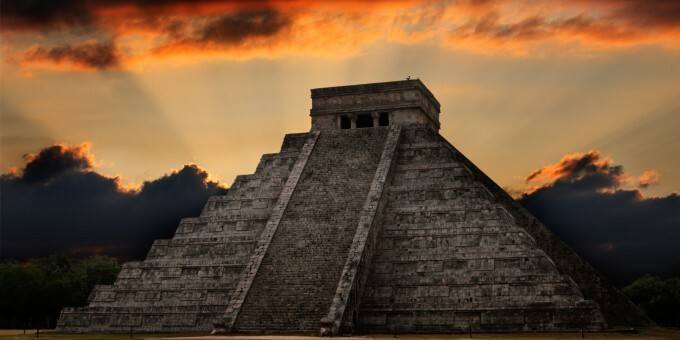 Staying at a hotel nearby and starting your tour of the site early in the morning will significantly enhance your experience of Chichen Itzá; see the article: The Best Way to Experience Chichen Itza for details. Chichen Itzá has a wealth of features that will take you all day to experience properly. Listed here are a few of the highlights; consult a guide book for further details. 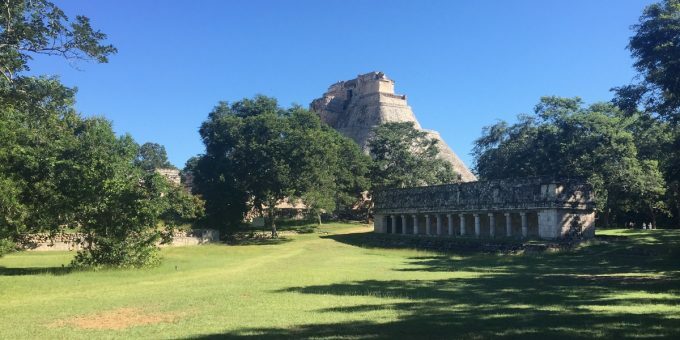 As you enter the site, your first glance will be towards the Piramide de Kukulkan, or Castillo (Castle). This pyramid has 365 steps, 52 panels and 18 terraces. If you visit during the spring or autumn equinox (March 21st and September 21st) you’ll be in for a special treat: The sun’s light touches the steps on the northern side, creating the shadow of a “moving serpent” which glides up the pyramid as the sun moves through the sky. Juego de Pelota Principal (Principal Ball Court) is the main one of eight ball courts, and the largest games court in all of Mexico’s archaeological sites. Here, you will see the famous stone hoops. It is believed that contestants of pelota (ball) needed to get a stone ball through them during the game. To the southeast, you’ll find the Templo de los Jaguares (Temple of the Jaguars) on which you’ll see carved rattlesnakes and jaguars. The murals inside depict an ancient battle. Tzompantli—Toltec meaning “Temple of Skulls”— is in between the Temple of Jaguars and the Castle. It was here where heads of those sacrificed were displayed for the gods. El Caracol (“The Snail” – named because of its circular structure and staircase) is actually an ancient observatory. This structure is an example of how the Maya were obsessed with time and astronomy. This building developed over time and was used by astronomers to accurately measure and record important days in the astronomical calendar, such as the spring and autumn equinox and the solstice. Chichen Viejo, literally meaning “old Chichen”, is the oldest part of the city; it has some interesting structures which date to the pre-Toltec times. If you stay at the Mayaland Hotel, you can also arrange for a horseback tour through Chichen Viejo. The Sounds and Lights Show, that is a mixture of colorful lights projected onto the pyramids, Mayan music, and a voice-over with commentary about Maya legends, is worth attending if you are staying overnight at one of the nearby hotels. It starts at around 7:30 p.m. (check times locally); the admission fee is included in the price of your entrance ticket to the site. By Air – The closest airports to Chichen Itzá are Cancún or Mérida. Many travelers to Cancún take a day trip here, although there are some good hotels nearby and if you stay overnight in the area, you’ll see more and enjoy a better experience of the site and area surrounding it. For detailed information about flights and flying, see the Mexperience guide to Air Travel in Mexico. By Bus – Depart frequently from Cancún and Mérida to Chichen Itzá, most often as part of organized tours to the ancient city. For detailed information about bus transportation read the Mexperience guide to Bus Travel in Mexico. Opening Days & Times: 7 Days a week; 8 a.m. to 5 p.m. Admission charges apply (check at local tourist office for the latest admission prices.) Multi-lingual guides are available for hire at the ticket booth. 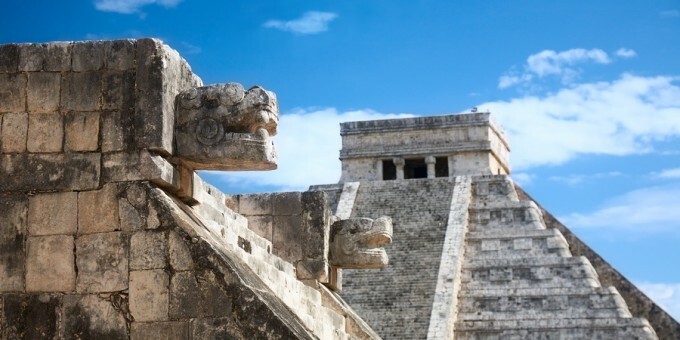 Better Overnight: Chichen Itza is a big tour-bus destination. Since it was nominated as a ‘New Wonder of the World’ in 2007, the center has become extremely busy during the daytime. If you want to miss the crowds and get the most out a visit to this spectacular archaeological park, stay for a night at one of the hotels situated next to the archaeological park and be among the first to enter the park in the morning. It’s by far the best way to experience Chichen Itza. Photography & Video: A permit is required if you want to use a tripod to take photographs at the archaeological site. A small fee is made for the use of hand-held video equipment. Read the section on Mexperience Mexico Essentials about Video & Photography at archaeological sites in Mexico. The local climate is the same as that for Cancun—hot, and humid. Be sure to keep yourself hydrated. The sun here is fierce, especially between midday and 4 pm. Wear light clothes, sun cream, sun glasses and a hat. Insect repellent is also useful to keep the mosquitoes at bay; carry and drink plenty of water at all times.